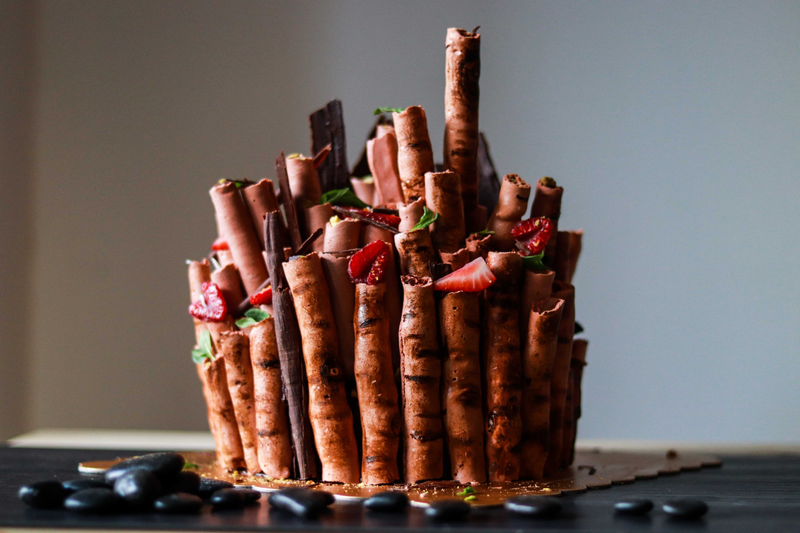 This mesmerising-looking cake is my take on the Concord Cake – a double chocolate cake that perfectly combines chocolate meringue sticks and chocolate mousse with homemade strawberry jam in between. This recipe is adapted from the Concord recipe by Kirsten Tibballs – the master of chocolate – as I borrowed her book Chocolate at the school library a while ago which I absolutely loved. I am not kidding, for a huge chocolate lover like me, I want to make EVERY SINGLE item listed in the book. In particular, I couldn’t take my eyes off her Concord as it looked so interesting and challenging to make. Yet, as you all know I always like to do a little bit adjustment to an existent recipe to make it more satisfying. This time, I straight away knew that I had to incorporate the classic combination of strawberry and mint to this chocolate cake, as the acidity of strawberry and the freshness of mint would balance out the richness of chocolate. Also, as I immediately associated the appearance of Concord cake to forest the moment I saw it, I wanted to accentuate the “forest ambience” through my presentation. Well, it was really a lot of fun to make this Concord cake. I understand that it might look very complicated but let me assure you that it’s really just a piece of cake & so much easier than you’d expect! Basically, all you have to do is make the meringue, pipe and bake them, and meanwhile you can prepare the chocolate mousse and the jam. Then you can start assembling the cake the way you like it. Easy, right? What’s even better is, that you can let your creativity run wild as the flavour combination for this cake is literally infinite – oreo/matcha/rainbow meringue stick, infuse some flavours for your chocolate mousse, or introduce new toppings etc. This time, my friend helped me use food colouring to paint some wooden patterns on the meringue sticks and I was shocked at how authentic they looked! To let you all understand how to construct this cake more easily, I asked my talented friend to draw me a step by step illustration below that’d help tremendously. To finish off the cake, I put some mint leaves, raspberries, strawberries, pistachios, shaved chocolate to add some colour and texture, and I am really happy about its final look. Don’t even begin to ask me how to cut the cake properly because YOU CAN’T, just tear the meringue sticks apart and share the cake unapologetically 😉 So that’s my Concord Cake and I hope you like it. Let’s make the magic happen, shall we? Using an electric mixer with a whisk attachment, whisk the egg whites and cream of tartar to medium peaks and gradually add the caster sugar (Don’t add the sugar with the egg whites straight in the beginning as the egg whites won’t whisk well). Once all the sugar is added, continue whisking for 1 minute so all the sugar dissolves (You can feel if all the sugar is dissolved by rubbing the meringue between your fingers). Using a spatula, gently fold through the coao powder and icing sugar mixture (Try not to knock out the air in the meringue, be as gently as you can). Stop folding once all the dry ingredients are incorporated. Transfer just over half to a piping bag with a 1cm plain nozzle. Line a separate baking tray with baking paper. Put the remaining meringue in a piping bag with 8-mm plain nozzle. Pipe individual lines the length of the tray approximately 1 cm apart on the tray. Bake both trays of meringue for approximately 1 hour or until the meringue is crunchy. Cool the meringue at room temperature. Put the chocolate in a heatproof bowl. Put the cream (a) in a saucepan over medium heat and bring to a boil. Pour it over the chocolate, let it sit for 3 mins before stirring it with a whisk by hand until the chocolate is melted and combined. When the mixture cools to around body temperature, add the butter and whisk again until incorporated to create a ganache. Leave the ganache at room temperature and set aside to cool down. Meanwhile Using an electric mixer with a whisk attachment or by hand, whisk the cream (b) to a semi-whipped consistency and set it aside in the refrigerator until the ganache cools down. Once the ganache is ready, fold through the chilled semi-whipped cream. Add mint extract and mix gently. Bring sugar and strawberry in a saucepan on high heat for around 2 mins until all sugar has dissolved. Mash raspberries with a fork as you go. Turn to medium heat, continue to cook the jam until it’s thickened enough to your liking. Ideally, it should be smooth and spreadable. Turn off heat. Add lemon juice and mix well. Transfer the jam into airtight jar for later use. Thanks a lot for your kind words and dropping by!